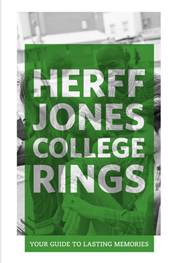 Since 1920, Herff Jones has been providing class rings, commencement regalia, announcements, college diploma frames, and other graduation products to colleges across the nation. Herff Jones believes your accomplishments need to be recognized and rewarded with quality products and service. Please visit the links below to order graduation products. myGrad™ from Herff Jones is a single point of contact for all your commencement needs, available online 24x7 and backed by the personal service of your Herff Jones representative. Promote participation with customized email alerts reminding students of ordering deadlines and events Promotions may be sent via Herff Jones according to our privacy guidelines or created to allow school distribution.